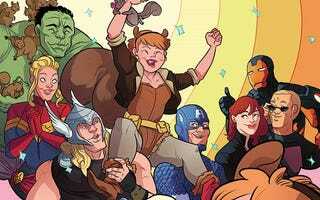 More Squirrel Girl Is Coming! Man, I’m glad both Unbeatable Squirrel Girl and Howard the Duck are making fun of the fact that they are getting new number #1s after only a short run. But still: this is awesome. Plus, it looks like Doreen Green is going to be juggling her college life (with Nancy and her fellow animal-talking superheroes Chipmunk Hunk and Koi Boi) with her membership in the Avengers...or, rather, the Avengers Idea Mechanics (look at Songbird! and Hulkling and Wiccan!). So yes: thank you, Marvel. Oh, wait Comics Alliance has a great interview with Ryan North, Erica Henderson, and editor Will Moss. RN: Erica, why are you looking ahead to such sad moments as when everyone finishes their degree and goes off to do other things? That is the moment when friendships change forever. The only way to avoid it is to pull a Saved By The Bell: The College Years move, where in the last episode of the regular TV show all the kids are looking forward to the prestigious universities they’ve been accepted to, and when the new show starts they’re all somehow at the same crappy university, and nobody talks about it, and everyone tries to put on a brave face, and the high school experience never ends for these characters and they’re trapped in an unending adolescent twilight from which there can be no escape. And that’s the worst. So yeah, this is all to say that they’re only in second year so far and they’re all still hanging out. EH: Ryan. We’re already at the university years. Next we get to watch them try to get jobs in their fields in the current economic climate that will still allow them to live in New York. Fun Fact: In order to do that, they’ll all have to live in the same apartment! See? Writes itself. RN: Dang, Erica! You just solved a problem we were going to hit three years down the road into our 15-year run on the title, and did it like it wasn’t even a big deal. Nicely done. Okay everyone, crisis averted! Squirrel Girl roommate hijinks can continue indefinitely.